If you have oily skin, have shine throughout the day and pretty much live with blotting papers in your makeup bag, you know that the struggle to curb oily skin is real. And then there’s the issues that often come along with oily skin – acne, enlarged pores, unrefined texture. In an attempt to curb back sebum production, you might have tried stripping toners, tried mattifying powders or cleansers for oily skin. Some of these solutions might work – but maybe at the price of now having totally dry, flaky skin. “It’s been about a month of me using this product; at first, I was using it only at night, and after a week or so I also began using it in the morning after I washed my face. When I pat it on, my skin becomes matte but definitely not tight-feeling or dry like if it were dehydrating. My skin has had reactions to skin products before but I haven’t had any with this one so far. My acne has calmed down considerably as well.” – Mary L.
“Love it! This toner has kept my skin clear for years now! I love it!” – Natalie T.
“Smoother, clearer skin! This really has made a difference in my pores!!! Try this out! – Marina C.
“I’ve been using this a little over a week now. I love how it evens out my skin tone and helps control the oiliness in my t-zone. It also works well with my sensitive skin. Usually my skin breaks out easily with new products, but not with this one. I would definitely recommend this to anyone who struggles with oily skin!” – Cristina T.
“Works amazing for my acne prone skin. So far it’s the best toner I’ve ever tried. Leaves my skin moisturized and well balanced plus smells amazing!” – Joanna S.
“My holy grail! I used to use Neutrogena alcohol-free toner every day, but even that supposedly gentle formula was too harsh for my sensitive skin. This stuff does the trick and then some! And I love the smell… Very light, not intrusive… Just clean and pure. 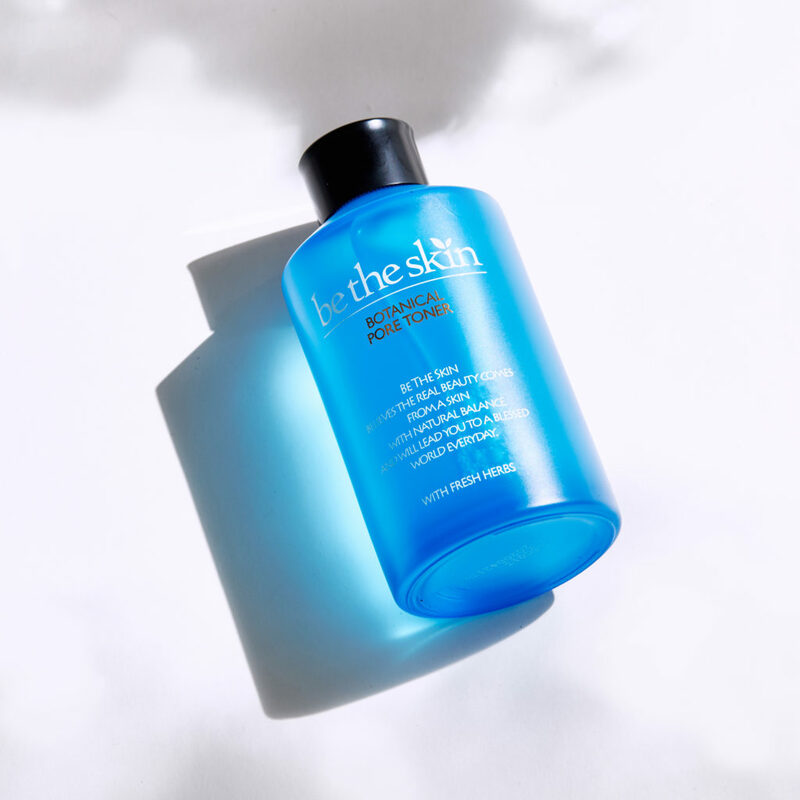 I always make sure I have another bottle of this toner ordered well before my current one runs out!” – Kara P.
“Major pore shrinker. I just bought this and I have to say the minute I put it on my face I could tell a difference. Also, it takes away the shine and dulls the oiliness. I will be keeping this one.” – Euodias W.
This toner includes fourteen different incredible botanical extracts in the formula. However, it’s not necessarily the number of extracts that makes this product so effective. The x-factor lies in the expertise of combining the right extracts together in different methods and in what precise ratio. Be the Skin’s parent company is one of Korea’s oldest natural beauty brands – Saeng Green. Over the years, their labs have tested a staggering number of botanical combinations and methods to combine them to perfect results. Some notable ingredients include witch hazel which helps curb back sebum production without stripping skin dry while wild mint extract helps to cool and soothe skin. Butterfly bush flower serves up plentiful antioxidants, and thyme is a natural anti-bacterial. However, when we sat down with the brand in their conference room, which was adorned with a showcase of their vintage toner bottles dating back to the 60’s, they explained that it’s not really the individual extracts that are providing these outstanding results for skin. It’s the specific methods they use in combining the ingredients and the very specific ratios of each ingredient. They also made sure that the formula would work well for even the most sensitive skin types and show visible results right away and also results that build over time. This is magical botanical alchemy at its best. This toner has been a classic on Peach & Lily since day one and it’s been one of the most loved products fully deserving of the Best of Kbeauty Award. Oily skin? Acne-prone skin? Enlarged pores? Give this a splash, your skin will thank you.